Last month I wrote a series of 26 posts, Aikido from A to Z, one for each letter of the alphabet, as part of the Blogging from A to Z Challenge, April 2016. It was, indeed, a challenge, writing 4-6 hours on most days. Also during April I participated, for the 4th time, in the annual 3-day “O Sensei Revisited” retreat, lead by Robert Nadeau Shihan. 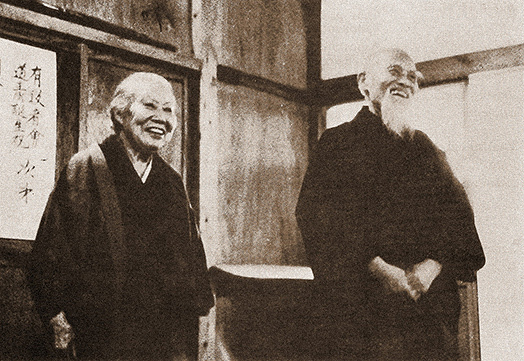 He is my teacher’s teacher – a huge influence on my Aikido and my life, both through my teacher, and directly. Nadeau Shihan uses Aikido to show us how we can arrive at better, bigger, “finer” levels of ourselves, in whatever we are up to, not just on the mat, doing techniques. April’s A-to-Z challenge was an opportunity to put this into action. I put it out there that I was committing to a post a day, and had to be a person who was doing exactly that. I declared myself to be a consistent writer, someone who does quality work and hits deadlines. And then I had to be that. The doing – how to go about it – was secondary to simply being a person who writes solid material every day, on time. I skipped zero days, even the days where I was out of town – I wrote those by doubling up the previous week. There were a lot of very late nights, often writing until 3 or 4 a.m., but I had a post up on my site before going to bed every night, all month. It was a rewarding month. I have some catching up to do in other areas of life, like getting my oil changed, and putting away my laundry, but I’m proud of the work I’ve done. I’m grateful for the support of so many Aikido friends and others, for their encouragement and kind words, and for sharing this series. I hope these posts ignite some interest and action among readers, and that at least a few folks will find their way to a dojo, or will see some new possibility for themselves. 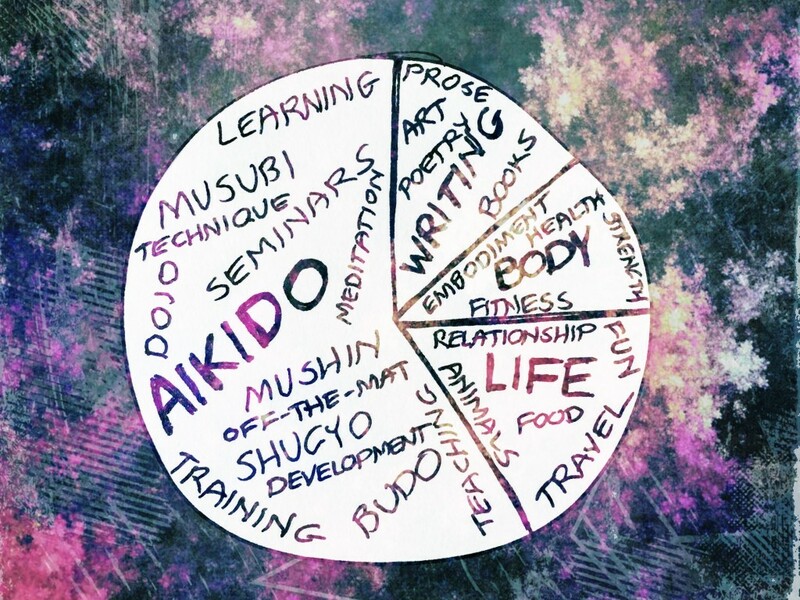 I learned a lot, both about the subject, Aikido, and about the process of writing. I found great new friends in a group of local writers – Laura, Kristen, and Natalie – as we all participated in the challenge together (at Laura’s invitation, actually). Now we’re going to continue supporting each other with regular meetings and ongoing online discussion. The next step, which I will be doing during May, is to create and publish a book using this work as a starting point. 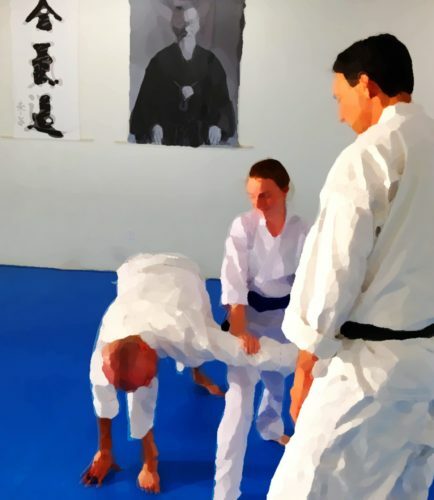 This month’s posts are part of a series of 26 posts, Aikido from A to Z, one for each letter of the alphabet, that I am writing during the Blogging from A to Z Challenge, April 2016. You can find all the posts, as they are published throughout the month, by following the A-to-Z April 2016 tag. Since the A-to-Z Challenge takes Sundays off, here’s in important idea to think about until Monday. In our age of access to instantaneous information we have gotten used to just looking things up whenever we want to know something. But there are some things that can’t be accessed that way – discovering how we feel about things on a gut level, developing physical skills, learning to work with others instead of competing with them. 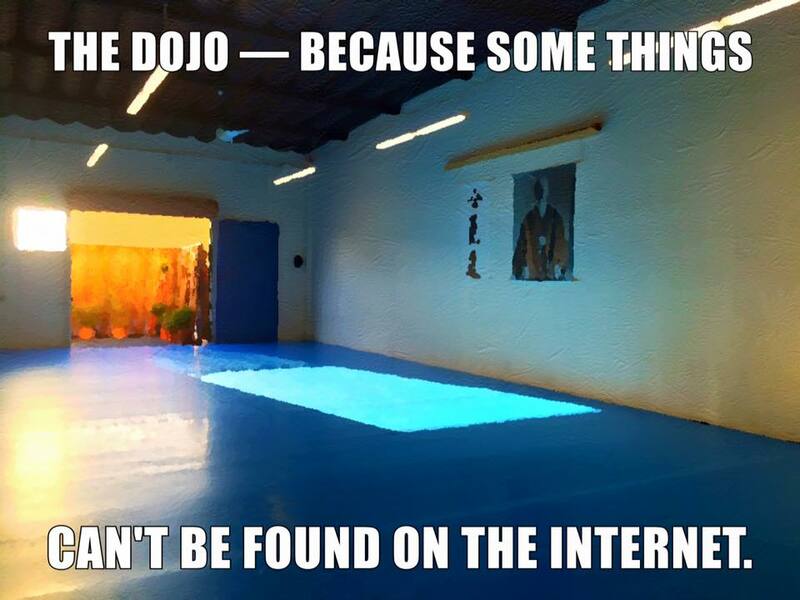 That’s why we have the dojo- because some things can’t be found on the Internet. Since the A-to-Z Challenge takes Sundays off, here’s a nice thought to keep you going until Monday. Since the A-to-Z Challenge takes Sundays off, here’s something fun to keep you going until Monday. Kids need to move, run, and play. 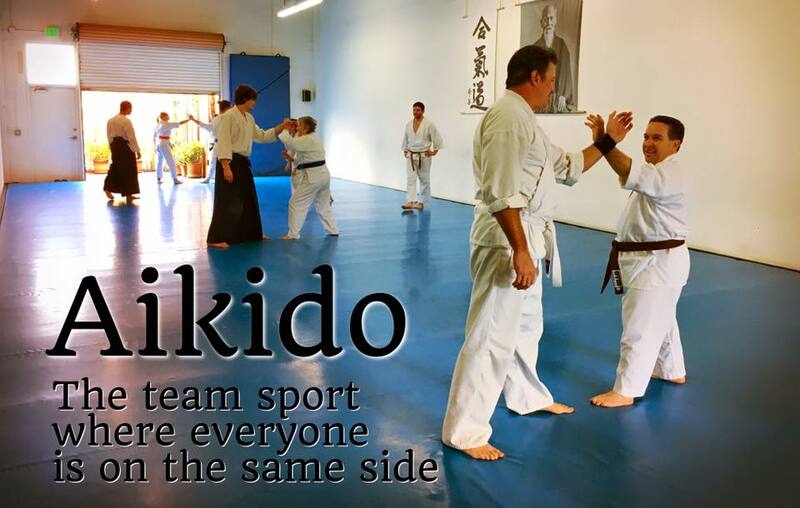 In children’s Aikido classes they learn to work together, in and active, positive, fun and challenging environment. 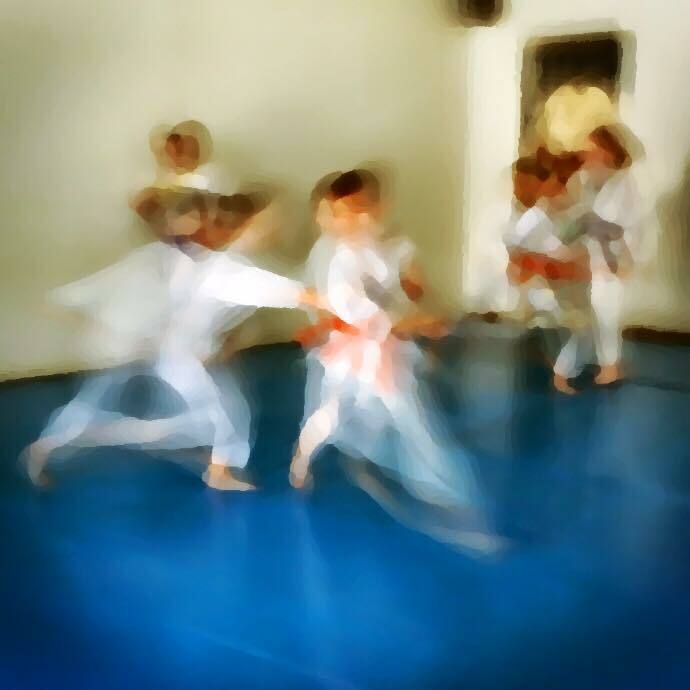 Here’s a spirited scene from one of our recent children’s Aikido classes. When I started writing here, I wrote exclusively about Aikido. 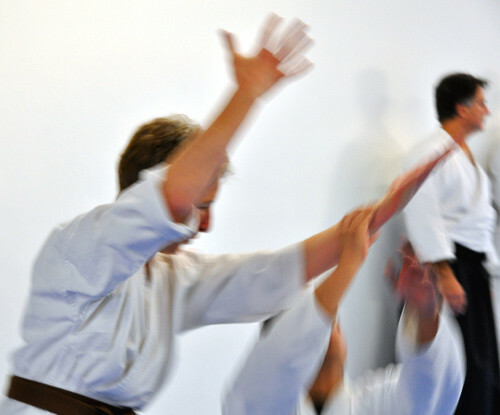 As time has gone on – over six years now – it’s become more and more difficult to differentiate what is Aikido from what is not. The poem about the November afternoon light streaming through the high window at the back of the dojo? A report I read about the cognitive benefits of practicing complex movements with a partner? The story about calmly changing my plans at the last minute, because the circumstances changed? I find myself filtering. This belongs, that doesn’t. But Aikido influences everything in my life, and everything in my life influences my Aikido. It’s all interconnected. To reflect this, I will be more inclusive about what I write here. I may discuss an realization from last week’s class with Sensei, something I learned about alignment and grounding while moving a heap of wood chips with our little orange Kubota tractor, or a brilliant comment by one of the young people in our children’s program. I may post about my work as a fitness professional, research supporting Aikido as a healthy activity, or my own progress in strength training. Photography, sketches, and poems? Yes, of course. When I write about the black-crested Phoebe perched on the splintered handle of the overturned plastic wheelbarrow, hunting insects on this wet winter morning, I will share it. Being still and observing a little bird from a place of wonder belongs here, too. So, grab my wrist, and let’s see what happens. I am very grateful to these amazing people for their instruction, encouragement, and ukemi. They trained with me and David (we tested together) for months, generously giving many Sunday afternoons, evenings after class, and a few Friday nights, too. Some of the nicest, most capable folks one could ever hope to train with. Domo arigato gozaimashita. Some photos from O Sensei Revisited III, in Occidental, CA. 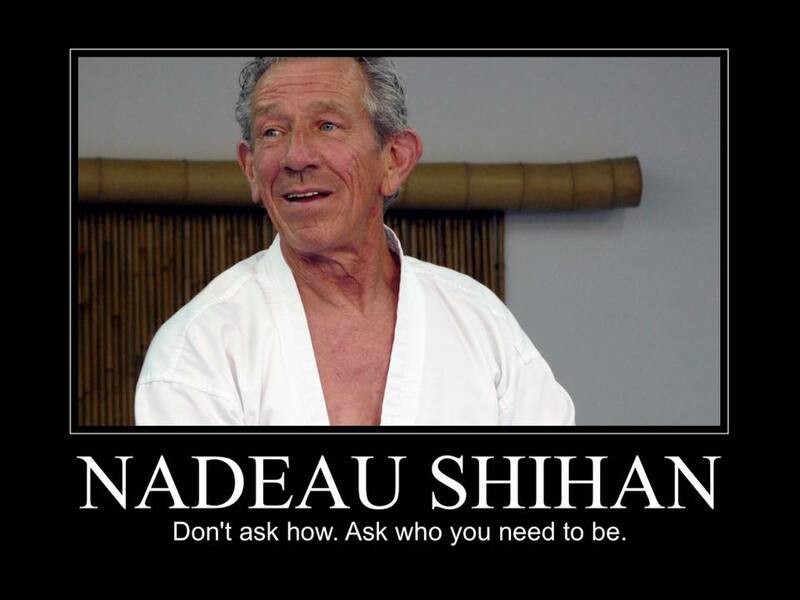 This very rich, full event is led by Robert Nadeau Shihan, and many of his senior students also teach there. Some of the instructors from this year were Jack Wada, Richard Moon, Elaine Yoder, Susan Spence, Jackie Cossman, Denise Barry, Roy and Paul (my apologies – I need to learn their last names), and our own Dave Goldberg. Also, Mary Heiny Sensei was there participating in discussions and Q&A sessions about O Sensei. Thank you to each of them, and everyone who organized and ran the event (Kenny, Brad, … probably a dozen others, too). And thanks to Jamie for shuttling us from the airport to camp, and back. Already looking forward to next year! There is nothing that touches us quite like being “gotten” – known for who we really are. Being recognized. And there are few things so exasperating as being seen as someone who you are not. The photo on the left is me, on my 2nd birthday, on what I’m guessing was a birthday present. A Wonder Horse. Like a rocking horse, but on springs. I think they make bull-riding practice rigs like this. I probably played on it until I outgrew it or wore it out. I’m sure I fell asleep on the damned thing. If they had these for grownups, there wouldn’t be a weight problem in our country. It was only a plastic horse, but it offered movement and energy and adventure and freedom from gravity. I loved that thing. The photo on the right is me, dressed and posed as someone I never was. I remember that day very clearly. They moved the round walnut coffee table over to where the photographer’s background was, for me to sit on. I was told to smile like that, and the photographer positioned my hand, with my finger against my cheek, and turned my head just so. I protested, but the photographer (who was a professional after all, and who knew best) insisted. I’m sure it was supposed to look sweet and cute. But it didn’t look like me. I was as furious as a little child can be. It still pisses me off to think about it. 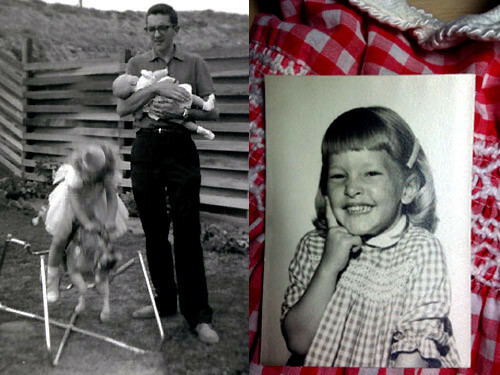 My mom recently gave me that red checkered dress from the photo, to do with as I like. I think I’ll burn it. When I was a kid I rode my bike or skateboarded everywhere (or cartwheeled, or pogo-sticked). I had pet snakes and a paper route. I hiked all over the local hills and canyons with the local gas station dog. I played street hockey and body surfed. I never had a Barbie. I hated dressing up. I liked bugs. My sister and I had to plead our case very persistently, but we did manage to get a slot car set (“but those are for boys”) for Christmas one year. All my life (thankfully not as much after 40) people have been trying to tell me I should be more girly. As a little kid I was told that of course I like pink. “All girls like pink.” (Blue was my favorite color.) I was supposed to love babies. (I’ve never had any rapport with babies, I’ve never wanted babies, and no, I don’t want to hold your baby.) I was supposed to adore wearing dresses. In 3rd grade the girls at my school were allowed to wear pants on Fridays. Only. In the summer of 3rd grade somehow I’d heard about a judo class at the YMCA, and insisted on joining it. I remember the room, and I remember endlessly slapping the mat and learning to fall (a skill that may have saved my life later on). The class was mostly boys. I don’t remember this, but my mom tells me they wouldn’t train with the girls, and that my feelings were terribly hurt by that. Being an outsider is painful. Later I worked on cars and built stuff with my dad. I got my ham license at 12 so I could join the Humane Society’s Animal Rescue Reserve (rescuing livestock in disaster situations). I fought my way into wood shop (where the teacher said he didn’t give girls As) and metal shop. Home Ec was still required, of course. Just for girls. A friend and I were the first two girls ever in our school to take Football in P.E., and we had to fight for that, too. But they drew the line at auto shop. No girls. No way. In 12th grade I trained in Tang Soo Do for independent study P.E. credit. It was mostly guys… I don’t recall any other girls in the beginning class with me, but one of the black belts was a beautiful young mother named Cristi, and she was clearly capable and respected. I never felt like “one of the gang,” but Master Kenyon never treated me differently than any other student. No less was expected of me. I loved training there, but had to stop when I moved to go to college. Girls are supposed to crave shoes, jewelry, makeup, perfume, shopping, cute clothes, and wearing frilly things. Naturally we must love chick-flick movies, spa days, and girls’ nights out. Whatever those are. Those assumptions and expectations alone are annoying enough, but there are more insidious aspects. I wasn’t supposed to be smart. I wasn’t supposed to be interested in greasy mechanical things, or computers. I wasn’t supposed to be good at sports. Possibly worse than obvious active discouragement – you can fight back against that – are the subtle low expectations and social exclusion. Simply not being invited to participate in things… “We didn’t think you’d be interested.” Not feeling welcome. How do you fight that? Girls aren’t even supposed to be strong. Seriously, I was often told as a young woman to avoid doing things that might make my arms or legs big – like swimming, martial arts, or windsurfing. “If you get muscles you won’t ever be able to wear cute clothes.” Fortunately I somehow didn’t give a damn what people thought, but a lot of girls buy into this, and forgo healthy, fun, empowering physical activity in favor of being acceptable to others. No one at the dojo has ever been even subtly discouraging to anyone on the basis of gender. Expectations are appropriate to the students’ experience, physical ability, and skill. But somehow in the context of Aikido recently, the issue of gender has been coming up. Someone mentioned the male:female ratio at the dojo a few weeks ago (about 3:1, I think). In a few small classes recently I’ve been the only woman. I don’t think I would’ve noticed except that I was the only one in the women’s dressing room. It doesn’t bother me in the least to train with just guys, but I do think it’s a shame that more women aren’t finding their way into martial arts. The reasons why are many, and have been discussed ad nauseum with no agreed-upon answer. For many I’m guessing it’s a lifetime of assertions about who we are (“Oh, you wouldn’t like that, it looks pretty rough.”), concerns over becoming physically unacceptable to others (having bruises, or keeping nails cut short, for instance), the discouragement of subtle low expectations (whether about ability or commitment), and maybe just plain never having been invited, or made to feel welcome once they join. Not welcome like an outsider who’s being treated with kindness, but one of us. 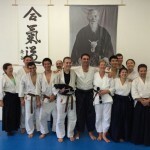 A friend of a student was visiting the dojo one day months ago, watching a class. Trying to strike up a conversation I asked her if she’d ever done any martial arts. She visibly responded as though I’d asked her if she ate kittens for breakfast, and said something to the effect of “Oh heavens, no!” I was so taken aback by her repulsed reaction that I couldn’t find a tactful way to ask what in the heck she meant by that. If I see her again maybe I’ll follow up. We may never have a solution, but meanwhile, invite someone, include everyone, and let people feel like they belong. To be more fully expressive in my writing and in my Aikido.